-- John Donne, "A Valediction, Forbidding Mourning"
was first launched in 2002, as a way of displaying an oeuvre which sets out in various directions from a central encounter. Also posted here are the works of two groups of associates, mainly contributors to The Deronda Review (formerly The Neovictorian/Cochlea). 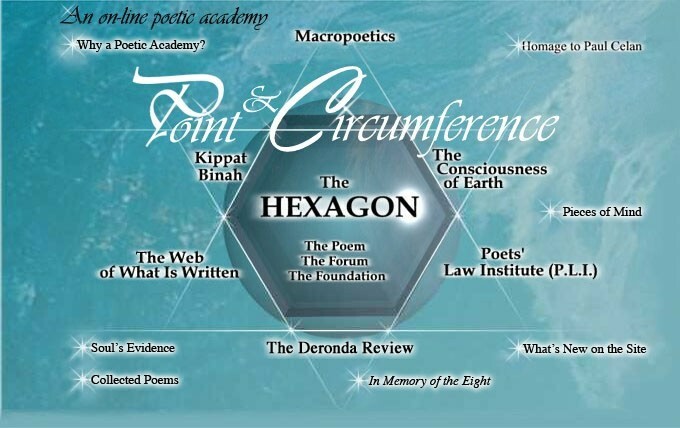 The poets in the “Hexagon Forum” are based in Western society and speak from the Western experience. The poets in “Kippat Binah” live mainly in Israel, and their poems are concerned not only with contemporary experience but also with Jewish tradition and destiny. To these two groups of poets, correspond two meanings of the title “Point and Circumference.” When this phrase first came to me late in the 1990's, it seemed an echo of Paul Celan's "Meridian" speech, which probes the connection between the poet's seemingly-private utterance and an encompassing reality. But I was not surprised to read recently, in the work of HaRav Avraham Yitzchak Kook zts"l, the sentence: "Israel and its essence are not confined to a restricted private circle. They are concentrated in a unique circle, and from that center they exert an influence on the whole circumference." Poetry, by getting to the roots of things, brings together what is apparently far apart. On the surface, Paul Celan and HaRav Kook were widely separated. Paul Celan was a “secular” Jew, a survivor who paradoxically became the last great representative of the Western poetic tradition. What had he in common with HaRav Kook, the first Chief Rabbi of Israel, a strictly Orthodox thinker deeply committed to the centrality of Israel and its land? Yet HaRav Kook was also a poet, and one who believed that the Torah could irradiate all fields of knowledge and endeavor, that the life of a renewed Israel could irradiate the world, and that poetry could play a role in this process. the wise imagination, and the word. and bring news of the whole to every part. We say the mind, once whole, can mend the world. To mend the mind, that is the task we set. but each shall bring a thread. When I showed this, four years later, to the rabbi who gave me my Orthodox conversion, he said that it reminded him of HaRav Kook, and recommended that I study his works. That was in August, 1979. Soon afterward I left for Israel, where I did begin to read the writings of HaRav Kook. But for various reasons I became distracted and did not make use of all the opportunities of Torah study that were offered. Instead I attempted to pull together a number of secular teachings about the human condition, again in the light of my understanding of Celan; that epic poem, The Consciousness of Earth, whose first chapter is posted here, was the result. In 1990 I found it necessary to return to the United States, where I studied law; the Poets Law Institute page reflects that experience. Also related to the law school experience are the poem in the middle of the site, The Hexagon, and the design for the “Hexagon Foundation,” another version of the “poetic academy.” Later in the 1990's I started a poetry magazine, The Neovictorian/Cochlea, and also began writing a series of essays on poetics, which are posted on the Macropoetics page. The aim of both magazine and essays was to suggest a return to a culture which, as I put it on the masthead, "offered poets an honorable place on the public state, not only as singers but as thinkers who could help to sort out the complexities of modern knowledge and life." At the same time, I remained connected to Israel. Friends made it possible for me to visit every two or three years; poets have sent me poems for the magazine; I have continued studying Jewish sources and have followed with anxiety the unfolding of what Israelis call "the situation. "The record of all this is found on the Kippat Binah page. I was in Israel while the war of 2006 was going on, and it was during this visit that I decided to change the name of the magazine to The Deronda Review. Finding this title was a little like Marcel's discovery, at the end of Proust's long novel, that Swann's way and Athe Guermantes way are actually connected. I had been advocating "neo-Victorianism" and maintaining a connection to Israel as two separate matters. Yet the prototypical Victorian author, George Eliot, concluded her career with a novel whose hero discovers that he is Jewish and sets off for Israel. Daniel Deronda looks toward a universal culture centered in Judaism. In the airplane on my way to Israel last summer I opened HaRav Kook's Orot again and found (I abridge somewhat in translation): "The spirit of holiness that is absorbed in the land of Israel goes on working even if it happens that a person must leave the country, because of an error or some compelling circumstance... the expectation of seeing [the land of Israel] again grows stronger and the picture of Israel is more and more deeply engraved on the soul." I must have read these words on my first attempt at studying Orot, in 1979, but I had not remembered them. Probably I did not know what they meant then, and only the years of absence from the country have taught me. As Celan said, "Are there such things as detours?" This website hopes to be a modest channel between two worlds that have need of each other. With the help of the Creator the circle will be unbroken, and the center will hold. except for included works by other authors, who hold copyright to their own works. This site is maintained by Adam Propp.